(Toledo, OH) I came across a peaceful space while wandering through Wildwood Preserve this morning. 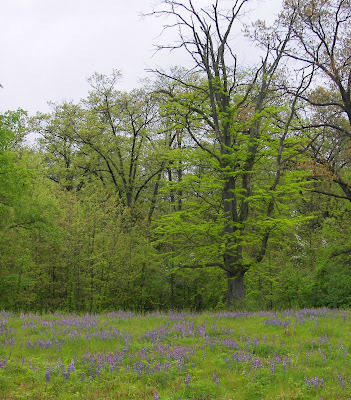 The meadow is named after Susan Horvath, who once served as Metroparks president. In the foreground are lavender-hued wildflowers, which add a pleasant aroma to the air if you stand downwind. In a brief tour of the trees that ring the meadow, I saw a Baltimore oriole, some finches, a scarlet tanager, and a downy woodpecker. Unfortunately, the poor light from the gray skies overhead dulled all the bird images I collected, and even the Baltimore oriole came out looking grayish-yellow. I will return soon on a sunny afternoon, perhaps even later today, to see if the better light will be more conducive for bird-watching and avian photography.